This petite beauty rewards you instantly with loads of perfect stars in cooling white color. 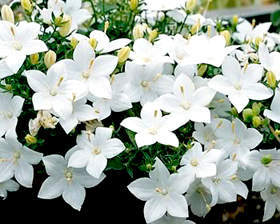 Thrives in the garden bed or as a tidy pot plant. Sow from February to late May on the surface of a good seed compost. Germination takes 30-90 days at 22C. Don't exclude light, sealing in a polythene bag after sowing is helpful.